I’ve been reading articles recently about pregnant women in those heady days of pure, ignorant bliss, before their babies are born. They are the ones who raise their perfectly shaped eyebrows at the mother trying to disentangle her toddler from the collection of Haribo at every checkout in the supermarket. The ones who look on in disgust at Costa coffee at the mother trying to wipe baby sick from her hair whilst attempting to discreetly breastfeed her baby, in the vain attempt at carrying on her life before baby was born. I know about these women because I was one. I would like to thank all my mum friends now for not saying anything to me back then. Their inner dialogue must have been one of quiet laughter as they thought, oh Katie, just you wait and see. I wouldn’t have listened anyway. Nothing, and I mean nothing, can prepare you for motherhood and the changes it brings. I’ve still not made it to my local Costa coffee. I honestly don’t think there is enough space for a double pram in it. I walk around my town eyeing up doorways and coffee shop windows to see if I could squeeze in and not take over the whole place. On our honeymoon, my husband and I were sat next to two families in the resort restaurant. One family seemed idyllic. They interacted with their young children perfectly, taking time to speak to them logically about everything. We both thought, yep, that will be us. The other family used to put an iPad in front of their kids at the dinner table whilst they all ignored each other. We took great delight in vowing never to be like that. Now, our babies are nowhere near iPads and televisions yet, however, can I just say how naive and stupid we were to even have an opinion back then when we were childless!!!! I thought the early days of motherhood would be spent with me blissfully breastfeeding and watching hours of box sets. It took me a month before I could even sit through an episode of Grey’s Anatomy without getting interrupted!!! I couldn’t get my head around it. Why can’t I have an hour of peace?!?!?!? 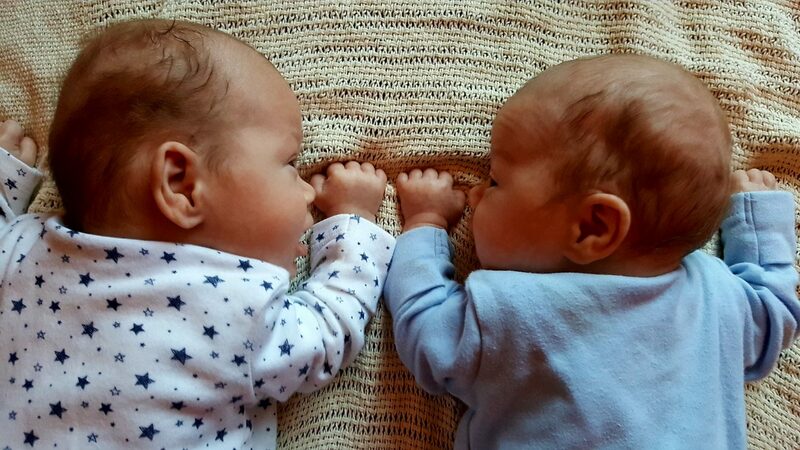 Oh that’s right – because I have two newborn babies demanding my constant attention. And that was with my husband on paternity leave. When he went back to work I panicked. How will I cope? to my mum’s house which is 45 minutes away – I’m invincible!! sit on my backside and watch a box set during the time I did have between feeds. I thought I deserved a break. I’ve just turned 40 after all. So, in a couple of weeks I will be joining the ‘groups’. Mother and baby groups. I’m a bit scared to be honest. Like I said to a friend recently, I still don’t feel like a mum. But I know we have to get out there. Mingle with ‘our kind’ now. We are starting off with Jo Jingles, which looks like great fun. Then baby yoga. I cannot wait for that. Followed by baby massage. Awesome! I will keep you posted. Congratulations. You are a miracle. Even writing in sentences is an achievement let alone a blog. Welcome to the world of mums. Will come and see you soon, I promise. PS. Enjoy the baby years, they are gone too soon.